Often mentioned together with adjoining neighborhood Lazybrook, Timbergrove Manor is a deed-restricted residential enclave that boasts of lush surroundings and a peaceful atmosphere. The neighborhood is highly popular for its central location, easy accessibility, and great value Timbergrove homes for sale. Within minutes of three major freeways (Loop 610, I-10, and Highway 290), Timbergrove homes have easy access to key areas like Downtown Houston, Museum District, and the Galleria. Timbergrove Manor is centrally located – having schools, parks, stores, cafes, and restaurants nearby. It also helps that the Heights, Memorial Park, and Rice Military are all within a stone’s throw of the neighborhood. Much like the trend seen in Lazybrook and Cottage Grove, Timbergrove real estate have significantly appreciated over the past decades. Its 86% appreciation rate is one of the best in the Inner Loop. Despite this growth however, Timbergrove homes for sale are still among the most affordable within the Loop. Contact Paige Martin, a top-ranked Houston realtor and head of the Houston Properties Team for questions and advice about Timbergrove homes for sale. 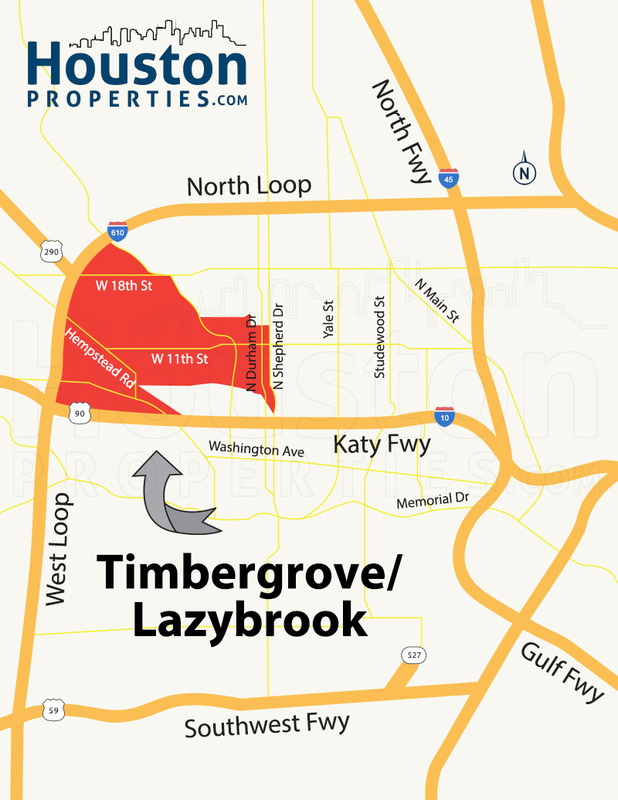 Timbergrove, one of Houston’s hottest neighborhoods, sits near the northwest bend of Loop 610. 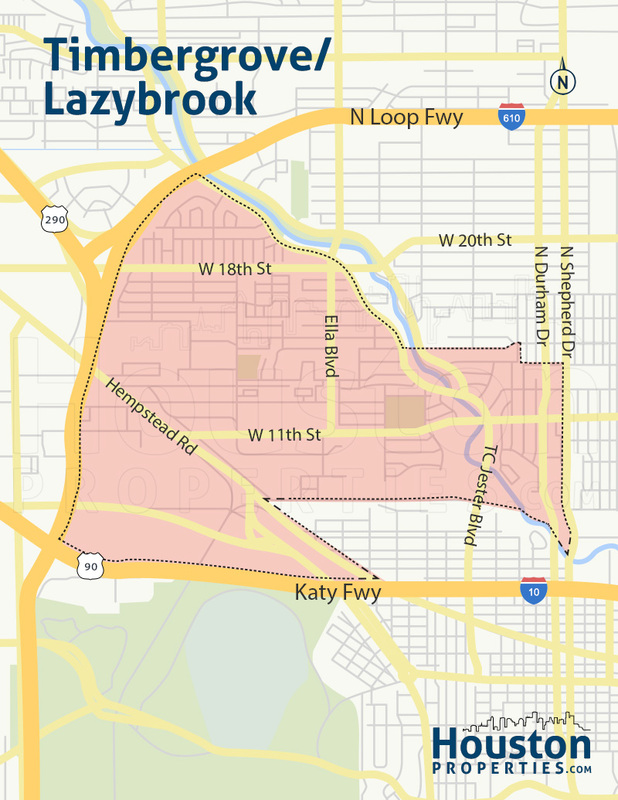 Lazybrook/Timbergrove is located directly west of the Heights and to the north of Cottage Grove. Garden Oaks and Oak Forest are located farther north, across Loop 610, while Memorial Park, Camp Logan, and Rice Military sit south, just beyond the Katy Freeway. Timbergrove Manor features two communities, one west of the White Oak Bayou and other to the east. Each community has its own homeowners association: the Timbergrove Manor Civic Club for the western area, and the Timbergrove Manor Neighborhood Association for the homes east of the bayou. Both communities are deed-restricted and mostly feature single-detached, ranch-style homes. Development in Timbergrove started during Houston’s post-WWII suburban boom in the 50s and 60s. During that period, Timbergrove homes mostly consisted of traditional and ranch-style homes on fairly large lots. Years later in the 90s and 2000s, young professionals and families were drawn to the area due to its close-in location to Houston’s key hubs and its affordable homes. Some updated or renovated their ranch-style homes, while other rebuilt more modern two-story homes. The transition from old to new has been slow in the Timbergrove, though it is not rare to see a custom-built home among the neighborhood’s rustic, vintage homes. Timbergrove is within the 77008 zip code of Harris County. Timbergrove Manor, though mainly residential, does have a few retail, dining, and entertainment options available within its borders. There are, however, more than enough sights and eats (along with nightlife, retail, and entertainment) so conveniently located in surrounding neighborhoods. With the Galleria, the Heights, Memorial Park, and Rice Military are all within driving distance of the neighborhood, Timbergrove residents have plenty of options from which to choose. Timbergrove also offers a number of green spaces including the Jaycee Park, West 11th Street Park, and Timbergrove Manor Park. Jaycee Park, located at 1300 Seamist, had undergone fairly recent renovation through the efforts of the Friends of Jaycee Park and the surrounding communities. The park now features a basketball court, a number of tennis courts, a playground, a 1/3 mile walking trail, a water playground, and picnic tables. West 11th Street Park, on the other hand, is a 20.2-acre nature park and is home to several species of birds, butterflies, and a wide variety of other flora and fauna. It is largely wooded, with trails and spots for birdwatchers. Residents also enjoy the White Oak Bayou’s 7.4-mile hike and bike trail, which is connected to several parks including Timbergrove Manor Park. With the Memorial Park a short drive away, Timbergrove Manor homes also have easy access to its many amenities, including a top-rated municipal golf course, nature center, and miles of trails.